In agriculture, forestry and ecology, these fields use Normalized Difference Vegetation Index or NDVI maps to assess vegetation. But what is NDVI? In general, NDVI uses two properties to quantify healthy vegetation. It uses near-infrared (NIR) because vegetation strongly reflects it. And it also uses red light, because plants strongly absorb it. For this same reason, this is why our eyes see vegetation as the color green. Now that you have a bit of background on NDVI, you can easily create NDVI maps in ArcGIS. Simply, follow these 4 steps. You can create NDVI maps with the image analysis toolbar in ArcGIS 10. All you need is imagery with red and NIR bands. For example, you can download Sentinel-2 or Landsat data from this list of 15 free satellite imagery sources. In this tutorial, we want to classify high and low vegetation. Pixels with high NDVI values indicate high vegetation or chlorophyll. Whereas, low NDVI values generally means less vegetation. Furthermore, negative NDVI values is a good indicator that it’s water. Let’s examine this agricultural area with center pivot irrigation. As this type of irrigation rotates on a pivot in a circle, it creates these circular crop patterns. If you want to display true color, select the red, green and blue bands in layer properties. We say true color because it is the same as how our eyes see. In the case of Worldview-2, this is would be band 5 as red, band 3 as green and band 2 as blue. But if you want to display color infrared, you need band 7 as the red channel, band 5 as the green channel and band 3 as the blue channel. We say color infrared because near infrared is in the red channel. As you can see below, the pivot irrigation vegetation should already be shouting out at you in bright red! Now, let’s go through the steps for how to create a NDVI map. 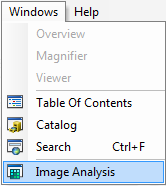 First, enable the Image Analysis Toolbar (Windows > Image Analysis). The image analysis window will be displayed in ArcMap. Second, under image analysis options, select the red band and the near infrared band. For Worldview-2 imagery, under the NDVI tab – the red band is “band 5” and the NIR band is “band 7”. Optionally select “Scientific Output” so your values range from -1 to 1. Highlight your layer by clicking it. Under properties, Select the NDVI icon which looks like a leaf. This will create temporary layer in the table of contents. Bright green indicates high NDVI. Whereas red has low NDVI. Highlight the new NDVI layer that you want to export by selecting it in the image analysis toolbar. Right click layer, and export raster to save into memory. High positive NDVI values (green) means high vegetation. While water usually has negative NDVI values (yellow and red). In general, urban features usually are near zero. How do you use NDVI maps? Normalized Difference Vegetation Index (NDVI) uses the NIR and red channels to measure healthy vegetation. If you want to calculate it manually, this is the formula you can use. NDVI always generates a value between -1 and +1. It’s really just a standardized way to measure healthy vegetation. But how do you apply NDVI as a remote sensing application? In the example above, agriculture uses NDVI for precision farming. If you look very closely in the NDVI image, you can see where crop growth isn’t as good. In this case, farmers can increase crop yield by knowing exactly where unhealthy vegetation is. Here are other GIS applications on the farm. Nearest neighbor classification is a powerful approach to classify segmented objects based on specific statistics and training samples chosen by the user. This is really very nice and helps for analysis. However, usually strict NDVI values aren’t declared. It is true that NDVI values range from -1 to 1 but in strict form the intervals aren’t given. So, that creates the problem to reclassify the NDVI values and impossible to estimate the area coverage and the like of the vegetation cover. Could you please help us the clear values (ranges) of the computed NDVI to estimate to generate more results. Where is the “Scientific Output” tool or tick box located in Step 2?I can’t find it.Please help. In the image analysis toolbar, click the top-left for the options. In the NDVI tab, “scientific output” is the bottom option. Click the check mark. Thank you for your advice but I’m using ArcGIS version 10.0 and the option is not there. What version are you using? How is this performed with Landsat 8 imagery, exactly? The images are separated into the bands. If I open 5 and 7, and run the options are described here, the NDVI button remains grayed out. So you will need bands 4 and 5. If you have these bands as separate images, then you should use the “composite band” tools. This will combine bands into a single image. After running this tool, you should be able to follow these steps and create an NDVI map. Version 10.1 up to 10.x uses NDVI the same as this. How do you follow the same process with modis data in ArcGIS 10.2, I intend to make natural color image so can I use the combination of band 1,2,1 as RGB??? How to calculate the AREA of the NDVI Ranges??? @Killi I have the same problem, you may have already solved it? Hi. Can someone tell me a way to convert NDVI values into chlorophyll? OR how to get chlorophyll content (mg/m2) in rice canopy? OR how to develop chlorophyll maps? Once I save and export the NDVI layer, the values are not scientific anymore and range from 200 to -31. How do I keep the layer from 1 to -1 after I export it to my map? Very useful, whereas I am more concerned about the specific location and distribution mapping of some plants only, out of complete vegetation of about 300 sq.km.